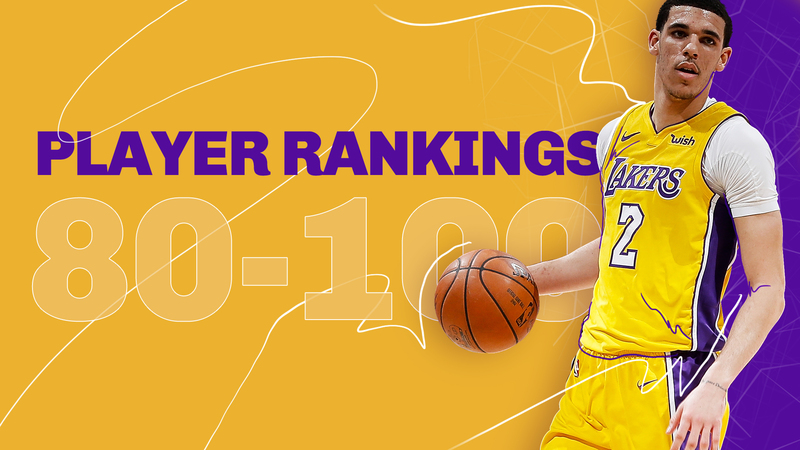 As we head into the beginning of the 2018-19 NBA season, we’re rolling out our Top 100 players, based not only on last year’s performance, but on this year’s expected production, too. To help choose and rank the players, we enlisted the help of two assistant coaches, one from the East and one from the West, and got thoughts from those coaches on each player. Those thoughts, from the coach representing that players’ conference, are included. Harrell averaged 11.0 points and 4.0 rebounds in just 17.0 minutes per game, earning him a two-year, $12 million commitment from the Clippers. Expect this to be a bargain. Harrell got better over the course of last season, his third in the NBA, and is a productive post scorer from inside the paint. He showed a bit of midrange ability, too, a new wrinkle for his offensive game. He’s undersized for a center (6-8), but can be solid as either a 4 or 5. Smith averaged 15.2 points and 5.2 assists, playing with size, strength and speed even as a rookie. He was not intimidated, which was mostly a good thing — though, sometimes, it forced him into bad shots or careless turnovers. Smith must become a better shooter, both from the 3-point line and in the midrange, because his 39.5 percent shooting just won’t be acceptable. He should benefit from playing with Luka Doncic, who will alleviate some of the ball-handling pressure. Collins had a very solid rookie season, averaging 10.5 points and 7.3 rebounds, shooting 57.6 percent from the field. He mostly played power forward, and while he has a polished game around the rim, his biggest development should come as a high-post and 3-point shooter. Schroder averaged 19.4 points and 6.2 assists last season, but the numbers came inefficiently (51.5 true-shooting percentage) and for the worst team in the East. Schroder is a score-first point guard who will have to make some adjustments playing for a Thunder team that has high aspirations and its own score-first point guard, Russell Westbrook. That Whiteside is an All-Star candidate who barely cracks the league’s Top 100 shows just how vexing a player he can be. He averaged 14.0 points and 11.4 rebounds, plus 1.7 blocks, and led the league in rebounds just two seasons ago, but coach Erik Spoelstra liked having Kelly Olynyk on the floor more, and Whiteside averaged just 15.4 minutes in Miami’s first-round playoff loss. He is entering Year 3 of a four-year, $98 million contract, and he is a big part of the reason the Heat have so little room to improve. Prince showed ample potential as a 3-and-D wing last year, averaging 14.1 points and making 38.5 percent of his 3s. He is long and tough, and he has gotten better on both ends of the floor in his first two seasons. Tony Parker, Manu Ginobili and Danny Green are gone, but there is reason to think the guard spot is in good hands with the Spurs, thanks to the addition of DeMar DeRozan and the way Murray played in the second half of last season. Murray started 48 games, mostly after the All-Star break, and averaged 10.1 points, 7.0 rebounds and 3.5 assists as a starter. More impressive was his defense — his 7-0 wingspan allows him to guard multiple positions and swallow up opposing point guards. His shot needs work (about two-thirds of his attempts came within the paint), but for a 6-5 point guard who is only 22, a Year 3 bounce should be on the way. Kanter started 71 games, finishing with impressive numbers: 14.1 points, 11.0 rebounds and 59.2 percent shooting. A decade or two ago, he might have been a star, but as a big man who can’t defend or step out to shoot a 3-pointer, he is not an ideal fit in today’s league. However, Kristaps Porzingis is recovering from knee surgery, which means Kanter will fatten up on stats again this year. This will be Evans’ 10th season, but he has played just a total of four playoff games. That should change now with Indiana, a team that should not only make the playoffs, but has a chance to advance. Evans reclaimed his career in Memphis last season as a sixth man, averaging 19.4 points and making a career-high 39.9 percent of his 3s. Fournier has established himself as a very good offensive player who can knock down 3-pointers and is not afraid to take difficult shots — sometimes a little too unafraid, as he chucks up too many bad looks. He is, like so many pieces on this Magic roster, a one-way player. Fournier can score, but his defense is terrible. Logic dictated that if Olynyk got more minutes and a consistent role once he left Boston, he would produce some better numbers. Sure enough, he had a bump in playing time with the Heat and justified their $50 million investment in him with 11.5 points and 5.7 rebounds, both career highs. He got better as the season went on, and he played 29.2 minutes per game in the playoffs. He’ll see a bigger numbers boost if that kind of playing time keeps coming his way. It’s been a long road back from an injury-plagued career for Dinwiddie, but he showed his ability (12.6 points and 6.6 assists per game) and his leadership in Brooklyn last year when the Nets lost Jeremy Lin and D’Angelo Russell. He was a candidate for the league’s Most Improved Player award, but if he is going to make real strides this year, he will need to be a better shooter (38.7 percent from the field, 32.6 percent from the 3-point line). VanVleet’s numbers were not overwhelming (8.6 points in 20.0 minutes), but he knocked down 41.4 percent of his 3s, was a clutch shooter and defender and ranked third on the Raptors in plus/minus (4.6), only behind All-Stars Kyle Lowry and DeMar DeRozan. He was a Sixth Man of the Year candidate last season, and he will be again in 2018-19. The most prominent beneficiary of Kawhi Leonard’s injury-addled season — besides, maybe, the Raptors — was Anderson, who got a significant boost in playing time and was able to show off the better parts of his all-around game, with averages of 7.9 points, 5.4 rebounds and 2.7 assists in 26.7 minutes. Anderson is a very good defensive player who is notoriously slow of foot, but he makes up for it with IQ. Ask around, and you’re not likely to get more widely varying opinions on a player as you will on Ball. There were times when he had a magic touch with his ability to see the floor last year, and he is a great rebounder for his position. He missed 30 games but averaged 10.2 points, 7.2 assists and 6.9 rebounds when he did play. Alas, there is the shooting: Ball made just 36.0 percent of his field goals, 30.5 percent of his 3s and 45.1 percent of his free throws. Ball needs to be a starter and develop his ability to run a team, which will be all but impossible with LeBron James and Rajon Rondo in LA. Rozier was outstanding in the absence of Kyrie Irving, helping carry the Celtics to within a game of the NBA Finals with playoff averages of 16.5 points, 5.7 assists and 5.3 rebounds. Of course, Irving is back and healthy, and it remains to be seen what Rozier’s role will be for Boston. Valanciunas was one of the best post-up centers in the league last year, scoring 1.09 points per possession on the play, an efficiency number that ranked him in the 92nd percentile. However, his defensive lapses limited his minutes to just 22.4 per game, a career low. Coach Nick Nurse is re-imagining how to use Valanciunas, playing him off the bench as an offensive wrecking ball against second units and trying to make him a better 3-point shooter. He is only 26, and a new role could help him find a place in a wide-open league that no longer values his skill set. Aminu remains Portland’s most important defensive player, a guy who can disrupt passing lanes, switch onto most positions and shut down a perimeter star. Offensively, he is still a liability, but he has at least developed a reliable 3-point shot that helps him stretch the floor. Aminu made a career-high 36.9 percent of his 3s, despite shooting just 39.5 percent overall from the field. But his defense makes him worthy of a Top 100 spot. The Rockets were roundly criticized for letting Ariza, a starter and key part of their revamped defense, escape to the Suns in free agency last year. Ariza averaged 11.7 points and made 36.8 percent of his 3s, providing his usual valuable leadership. He will now be tasked with bringing into line the wayward youth in Phoenix, which is no easy task. Sabonis was not the featured piece in the deal that sent Paul George to Oklahoma City, but he did not disappoint in Indiana, where he averaged 11.6 points and 7.7 rebounds, mostly coming off the bench after a rocky first season as a starter with the Thunder. Roberson played only 39 games, averaged 5.0 points and was an abysmal shooter (22.2 percent from the 3-point line). But he is on this list because he is an outstanding defender and because Oklahoma City is not the same team without him. Before Roberson was injured last year, the Thunder were sixth in the NBA in defensive efficiency (103.4), but just 15th after he was hurt (107.0).